Second up, "Ghosts of Girlfriends Past". I heard this was TERRIBLE and I believe I saw it on some worst movies lists. Maybe because I saw "The Ugly Truth" first, I really don't think this one was that bad. At least you feel like all the characters in this movie are in on the joke - the guy knows he's morally corrupt and he will change it in the end! Blah blah blah. By comparison, the characters in "The Ugly Truth" seem to celebrate their shortcomings and have no desire to change! C'est La Vie! One note - both of these actors are getting a tad too old to play characters that are still trying to find that first real love and still seem completely unsure of themselves. You can't keep making this same crap over and over for years! Worth 75 cents of the dollar I spent - and it is only that good because Michael Douglas is in it and he was top notch as always. 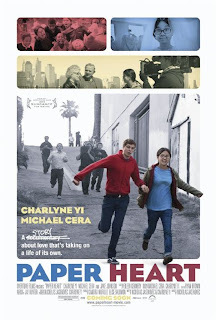 Finally, the only movie I picked was "Paper Heart". I came in expecting little and got exactly what I expected. The potential for something unique is there. The little "interviews" they did across the country are great. The little touch of what seems like the real Hollywood scene today was kind of cool. I rented it because I really liked "Nick and Norah's Infinite Playlist" and Michael Cera is in here. He is fine. But Charlene Yi can't stop making goofy and annoying faces every five seconds. She did it while doing press for the movie and she does it all through the movie. Maybe as a character on a stage that works. Here, she could be a touch real, maybe? We get the nerd thing - we get the whole schtick. In little portions, funny. For 88 minutes, ugh. Worth 50 cents of the dollar I spent.